@TheFryGuy, I started suspecting it once I heard the words "cultural appropriation." Is it bad that I'm hoping for a zombie apocalypse? @Captain Anderson, But it’s not entirely alien because a few years back Harvard(I believe) “celebrated” their first racially segregated graduations. @Captain Anderson, that’s still immoral. The idea that people should be treated differently based on their skin colour is still racism. @TheRatMan, and then there’s Evergreen State which actually mandated the absence of white people for a day and then fired a teacher who refused to be racially discriminated against and went to his job despite being white. @Captain Anderson, if you don’t see how demanding a particular race of people remove themselves from the premises isn’t exclusionary, I really don’t know what to tell you. @I Are Lebo, you have a miraculous capacity for intentionally misinterpreting words. I clearly said that the impression I got from the article was that people of other color were not excluded, and could attend the events, but the content was geared towards specific ethnicities. @Captain Anderson, then the impression that you got was incorrect. Bret Weinstein was put through the wringer by the university and the public for refusing to be segregated based on his ethnicity, which is what the point of the day was. They had events which were ‘people of colour only’, and ‘anti racist workshops’ aimed specifically for white people. When Evergreen canceled this event after the scandal and controversy went public, BLM protested the school because they support racial discrimination against white people. The entire point of the Day of Absence is segregation. That is by nature exclusionary. If you specify a particular group and demand their absence, you are excluding them. White students who ‘forced their presence onto the campus’ during this day were also subject to harassment. You aren’t paying attention to what’s actually been happening. @I Are Lebo, you and I seem to have gotten very different information when reading this article on this website. Where did you go to inform yourself further about this specific event? @Captain Anderson, the event being the Evergreen University’s Day Of Absence? @Captain Anderson, I went to a variety of sources, including a couple of youtubers whose opinions I find valuable and who seem to be honest in their approach, as well as several news sites, and then finally the actual website for Evergreen University. Their page is what sealed it. It’s ideologically identical to what the KKK conclude, only approached from a different mentality and with a different hierarchy of race based on different criteria. It is the notion that people should be treated differently based on their race. I reject this idea wholeheartedly, regardless of which race is to be treated which way. That’s not equality. The idea that white people alive today bear special responsibility towards black people because of the actions of past white people is a racist idea that is based off of the concept of hereditary guilt. It’s immoral and hypocritical, to say nothing of it being exclusionary. Aaaand the progressives progress into the past. @big freedom, isn't that pretty much what they've been doing from the gate? @Not him again, what do you mean from the gate? @K1l, out of the gate, off the bat, from the beginning, etc. @K1l, alright, well maybe it started with good intentions of wanting better equality for people, but it's gotten so overbearing that now it's gone full circle on itself and is now oppressing people that used to be considered "normal". Instilling ideals in young people that they should just be handed things because "they deserve it because the life is hard". Using social media as a soap box for any minor inconvenience in your life and demanding to be put on a pedestal, yet diminishing anyone who disagrees. Many of the same people who claim not to want to conform to society's "norm" are the exact same people who get outraged when society won't conform to their agendas. @Not him again, it seems to me like the problem isn’t the desire for equality but rather the push for equity. Equity is immoral because it assumes that everyone should be having the same outcome to every situation without consideration for work ethic or personal responsibility, or other variables. Equity is the idea that how much a person deserves is contingent on how much they have. It’s a petty, self absorbed ideology. When it’s combined with the bigotry that is intersectional feminism, then you have people arguing that the opinions of a majority group (really just men and white people) don’t matter, which is the step of unpersoning that comes just prior to committing violence against the outgroup. @I Are Lebo, exactly. Things have gone from "standing up for yourself and your beliefs" to "I'm right and you are wrong and not only should you feel bad, but I deserve better than you", at least in the broad overcast view of things. @Not him again, indeed. It’s not “I disagree with you”, it’s “you’re a bad person”. @Bow To Your Senpai, Squidbillies did this... Kinda. Couldn't afford a wall around the Mexicans, so they built a wall around themselves. But, labor is hard and good laborers are expensive. So, what's a squid to do other than hire some Mexicans. Wow I think I read a book that had something like that! Blame your local leftist liberals. The retards of American society. Please tell me this isn't real. @Proactive Citizenry , I really, really wish I could. I'd love nothing more than to say that this is all a farce, and that this is just a parody news site. But unfortunately, it seems to be legit. I weep for the degradation of our culture. Martin Luther King Jr would be rolling in his grave if he saw news like this. @Proactive Citizenry , it’s some kind of day workshop the college setup. It’s fairly weird. But definitely nothing where the whole university is now segregated. Google the title of the article and it’ll tell you more. If we do not learn from history, we are doomed to repeat it. 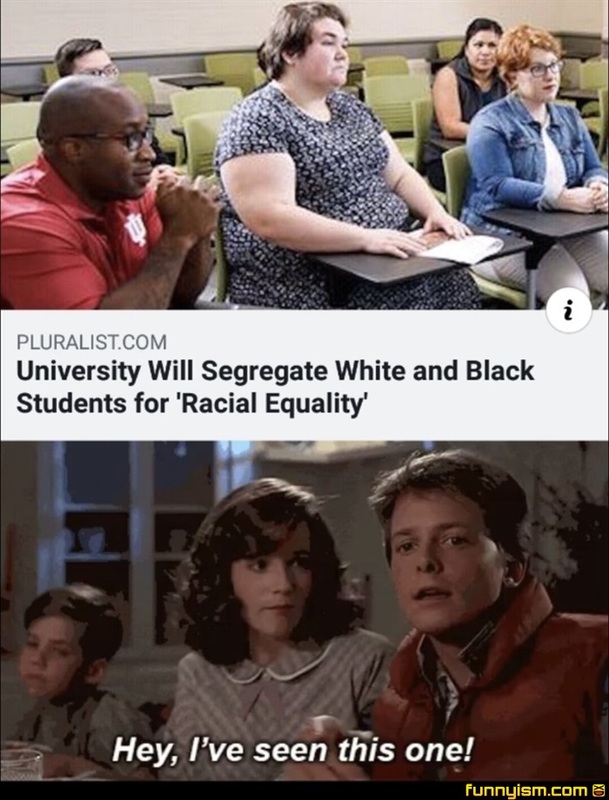 It’s not really segregation. They’re holding a workshop focusing on racial equality and having different ethnic groups separate, so like white people will take a class on accountability for white privilege and dismantling racism, etc. Y’all just post anything and refuse to research to make progressives and leftists look bad. @griffinstorme, if you treat people of one ethnic background one way, and people of a different ethnic background another way, with different events scheduled for each group, that’s what segregation is. Having an event that teaches black people why they’re oppressed and another that teaches white people why they’re oppressors is racist. Period, full stop. Asking that students separate themselves by race and act accordingly is asking students to self segregate, and the only reason why it’s phrased as a question is because if it was mandated by the university they could be sued or even charged with a hate crime. It is you who has refused to research this to find out the truth. Look up Bret Weinstein and find out what happened to him for standing up against racism at Evergreen U. @carguy25, there are dozens of studies showing the lasting economic effects of slavery and segregation, cops more unfairly target PoCs, and employers discriminate against ethnic people in the hiring process. Yes. White people don’t experience that. That’s privilege. @I Are Lebo, the event was teaching how white people can use their status to help combat racism and supremacy, but go off I guess. Keep touting your little evergreen example even though it proves nothing in the grand scheme, it’s just anecdotal. as an example of segregation in practice, not as an anecdote to ‘prove’ that it does. There are a number of examples of self styled Progressives pushing for segregation. Separating your students by race and teaching them different things about race based on which race you’re teaching is segregation. I really don’t understand what part of that is confusing for you. @griffinstorme, one other thing. Telling white people that they bear guilt for the actions of past white people and have a unique responsibility because of slavery is not “combating racism” That IS racism. You keep using that phrase. I don’t think it means what you think it means.